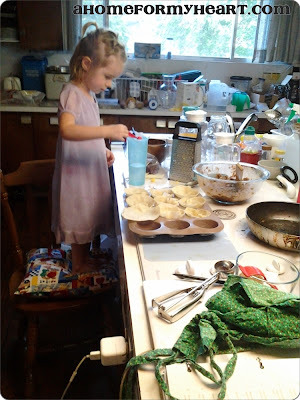 Once upon a time I read a post over at Simple Mom in which Tsh mentioned that she used Pinterest as a meal planning tool. I don't remember how she described it, but I thought it sounded neat... and like it might actually help me visualize the meals I was trying to plan! I signed up for Pinterest on the spot. As you probably know, you can lose hours and hours to Pinterest without realizing it. There are some who feel that Pinterest is a complete waste of time, but I have found that for me, it is not. My struggles to effectively plan (and make) meals for my family did not evaporate back in 2011 when I started my What's for dinner? Pinterest board, but over the years I have collected a variety of pins that I can browse, looking for something that looks appealing to my mood. 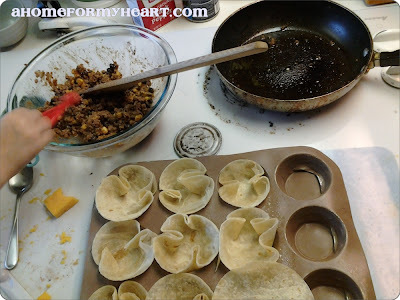 Some of the recipes in my dinner pins are beyond my skill right now, but with every recipe I try I find I am more able to manage the process of collecting ingredients, following the recipe, and making meals for my family. This week I tried three (THREE!) new recipes! And I only called my mentor a few times ("!! We don't have any breadcrumbs!... What do I do?") AND I actually comprehended what he said and wasn't intimidated by his suggestions. 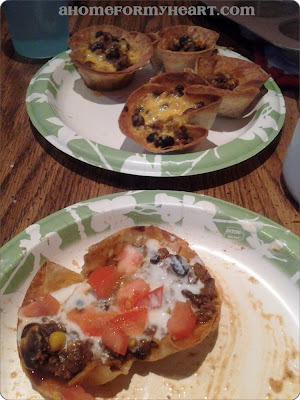 Here is one of the recipes that I tried this week: Mini Mexican Pizzas from Dashing Dish. 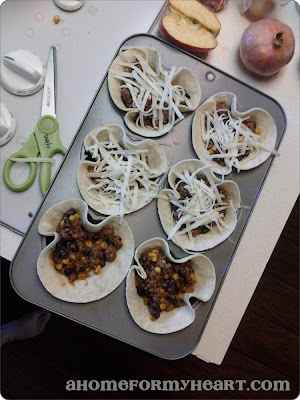 Ground beef, re-fried beans, salsa, and taco seasoning in tortillas sprinkled with cheese. Six ingredients (plus optional toppings). I'm growing! My limit is usually about five ingredients and then I start to feel intimidated. I even experimented a little, too! The original recipe called for whole wheat tortillas, cut into smaller circles to make "mini" tortillas. Well, we didn't have whole wheat tortillas, so I used flour tortillas. But it seemed like extra work to cut them smaller (even though they came out deliciously crispy) so when I made the recipe again (I made it twice this week! I feel impressed.) I used white corn tortillas, which is what nearly all of the Spanish hermanas on my mission used. The white corn tortillas are smaller than flour tortillas but bigger than mini tortillas, and are nearly always in our fridge. The corn tortillas were faster to use and made bigger servings, so I think they're a keeper. The ground beef was a bit of a problem because I am not very comfortable shopping for or cooking meat. But Lost Boy helped me by buying the ground beef for me. We had salsa (phew! ), but no refried beans. But that wasn't as big a hangup for me as it could have been, because ever since the mission I have preferred black beans and watched the hermanas from my mission mash them like refried beans. I added some frozen corn (because I like corn and black beans together, and because Katie said she likes to put corn in the recipe). And then there was taco seasoning. We don't have taco seasoning. I don't like taco seasoning. It doesn't taste like the Spanish food I ate on the mission (and I ate Spanish food from a lot of different Hispanic cultures). And it is always too salty. 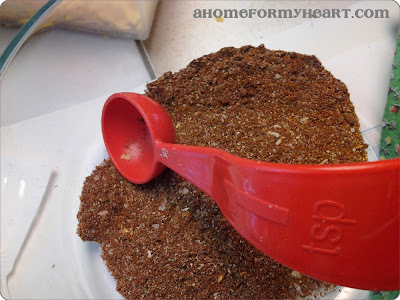 So I looked up a recipe for homemade taco seasoning online and made my own! I felt so accomplished that I just pulled it all together in a few minutes. But I have to attribute my success to a friend who gave me all her spices when she moved out of state and couldn't take very much, and to Grandpa Freddy, because we inherited all of his spices when we moved into his house. Between Robin and Grandpa, I actually had all the spices I needed on hand. I still don't really like taco seasoning, but I like feeling that I have control over the flavor. Next time I make it I'll put in less chili powder and more cocoa powder (I don't know what hermanas really use, but cocoa powder strikes me as potentially authentically Mexican - just think mole!). Then there is the grated cheese (I can do that!). And bake it for not very long (less than 20 minutes, good deal.) And viola! We didn't have any sour cream, so we used kefir (which I'm trying to incorporate into our daily diet). And I chopped some tomato to put on it. The first night I made it I ate a whole half of the mini tostadas and 2Flowers ate two halves of two mini tostadas. I think this recipe might be a keeper. I Pinned it. And I did it! categories: Pinned it. 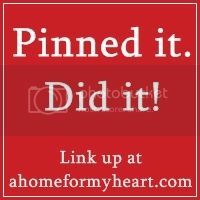 Did it!, recipes.